Disclaimer: I was sent this product for reviewing purposes. All words and opinions expressed are 100% my own. Unicorn with popper in it's mouth and ready to shot. Somebody loves the little rainbow colored poppers. There are no words to explain how excited I was to receive this unicorn popper, first of all I love unicorns and rainbows and this was the perfect combination of two things that I love. But enough about me, how did the kids feel about it? Valentina loved the fact that the little poppers are soft and colorful and that they fit in her little hands. Miguel loved the fact that the unicorn pops out the little balls. He had fun attacking his other toys or me in the leg - ha! The little poppers are soft enough that they don't hurt and if they were to hit your little one the impact is not hard since they are made of very soft foam. This does not mean that you can pop yourself in the eye, so don't go trying that. 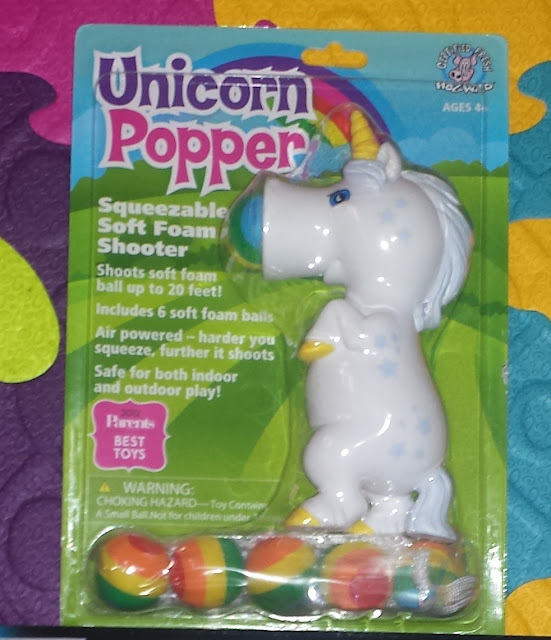 All you have to do is insert the popper in the unicorns mouth and then you squeeze it's belly and out comes the popper. The unicorn is also made of a soft plastic. These definitely make great stocking stuffers for boys, girls and grown ups. It's a fun toy that provides hours of fun. and places like Amazon and your local Bed Bath & Beyond. Make sure to follow Hog Wild Toys online here so you can stay on the loop with their newest toys.